In the lead up to JWOC our team along with the Aussies have done a series of simulation races where you are given all the relevant information to simulate a JWOC race. We did a long race, a middle race and a sprint, which Cam has already reported on. The long JWOC simulation was held last Wednesday on a map called Marchaevo. Since we would get too tired if we did full long courses around 8-11kms, instead we did courses of 2.55kms for us girls and around 3.1 for the boys. 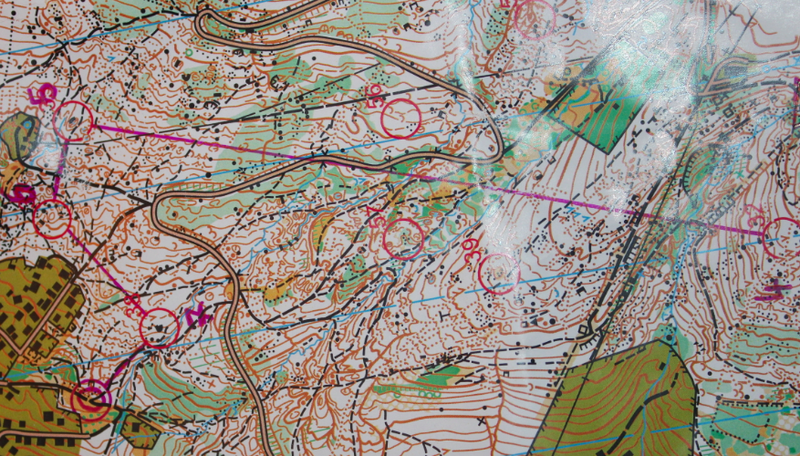 Within these courses there was a variety of leg styles such as short, middling and long route choice specific legs. This is the break down of the girl’s course. The boys did the same but just had an extra loop at the end. For me personally I get really nervous when I race, and often bomb out on the first leg if my nerves get the better of me. So for the simulation races I really wanted to get myself psychologically worked up and nervous for the race to give a correct representation of how I would probably be feeling for the real thing. Therefore I would have to practice getting back in control and know what the best way to do that is. In the start box I was really jittery and unfocused, this meant that when I turned over the map for the first time It took me a while to focus in on the first leg as I ran to the start triangle around 250 meters away I evaluated the three obvious routes choices for the leg 1. Pretty much straight lining it, using the cliff as a hand rail then popping out and hitting the track, running along there then dropping down when you see the two elongated knolls which sandwich the track. Option 2 which I took, after I forced myself to stop and take some time to focus at the clearing before I ran the leg because I knew that otherwise I would crash and burn, was going right up the small track through the green to the track along the spur. I ran along the track until I hit the series of cliffs and the re-entrant with the stream, then sidling along the slope ticking off rock features as I went with my attack point of the erosion gully before the rocks which the control was actually located on. The third route choice which Kayla took, which was probably the best, was running far right and hitting the lower track before running right around the spur along to beneath the control and then running up and hitting it. This was probably the best route choice because it was simple and easy for getting into the map running fast and you had an easy attack point with the water trough on the track. For the second control the key thing to get right was your exit direction from your compass out of number one. If you got this right, you would see the water trough on the track cross the erosion gully in the green look up and see a cliff and then hit the boulder which number 2 was situated on. A number of people made mistakes on this control when their exit direction was slightly off meaning they were sucked down often further to the left if standing at number one. Leg 2-3; I ran down the spur, ticking off the rock features and crossing over to the cliff when I saw the green below me in the re-entrant. For leg 3 to 4, it was easy to get overwhelmed by the detailed rock and contour detail on the side of the spur, to avoid this I ran slightly up above the majority of the rock detail so that when I looked up I could see the track and clearing at the head of the spur and down on to a series of cliffs and depressions. This meant I had the two lower pits in the circle and ran up to the pit, which the control was on. Leg 4-5 was the key route choice leg that almost everyone who ran the course took a variation. Obviously there is the classic left, right and straight. However from this because of the numerous tracks and the run ability of the terrain, people often cut across shortening their route and distance but not always in time! I took the classic straight road option heading hard right out of the control up through the start triangle and pre start area then down past one split and one corner before cutting off the road at a sharp hairpin onto a four wheel drive track then straight up a smaller track hitting the control bang on! This route choice enabled me to mentally take a break from the terrain run hard for a period and also take my gel. My catching feature for this leg was the clearing I could see in the distance before I took a right turn into the control. 5-6 was straight back down the hill along the track running to the left of the depression, and hitting the hill bang on. ye yeeee !!!!!! Leg 6-7 I screwed up, since I had been running hard I wasn’t ticking off my features as tightly as I could have been and ended up taking a funny bearing off the track split heading high and only catching myself on the cliff/ tunnel which was on the side of the road. From here I smashed it down to the cliff hitting the control and running on to the finish. Overall, I think I ran this course well coping with my nerves and sticking to my race plan of taking the first control slightly slower to become confident. The key techniques that I used on the course were attack points, catching features, exit direction, bearing , rough pace counting/visual distance measurement, evaluation of route choice (which was best for me personally), stepping stones, simplification and traffic lighting. 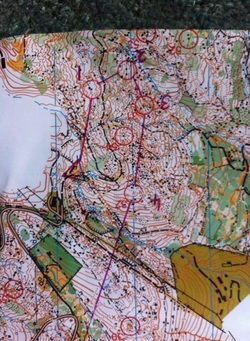 Thanks to Rob, Hanny and Toph as well as Anna and Karen for a well-organised training week in the lead up to JWOC. I am feeling well prepared and I am excited for this new challenge JWOC will bring!